← Does Obama’s Commitment to Christianity Trump Commitment to Constitution? Note: This is Part Seven in a series, “God’s Emotions: Why the Biblical God is so Very Human.” Parts 1-6 are available at this website or at www.awaypoint.wordpress.com. Levin’s book is meant to be a commentary on the sexist narcissism that lets some men treat women simply as a means to meet their own desires. But in reality, we all have a little bit of the Stepford husband in us, both in our personal lives and in our religious yearnings. Approximately sixty five percent of preschoolers, especially those who are firstborns or onlies, meet some of their social needs by creating imaginary friends. One of the appealing aspects of the imaginary friend is that she is at her creator’s call—perfectly available when needed, perfectly absent when not, ready to engage in whatever play activities, conversations or even spats that a child may prefer. Research suggests that these imaginary friendships have real world benefits. For example, they appear to help children hone their verbal skills or explore difficult feelings. But God loves me, what does that mean? My Encarta dictionary says that within Christian belief God’s love is the “mercy, grace, and charity shown by God to humanity.” That sounds close. But the Bible says in many places that God is merciful, generous, and full of grace. It also says that he is loving, and I think the writers meant it—in part because we humans don’t know how to conceive of a person-god without emotions. How would we relate to a Spock-god? How would he respond to our emotions? Imagine baring your deepest feelings to an omnipotent, omniscient, omnibenevolent supercomputer in the sky– who doesn’t love you. Persons without emotions are the stuff of comedy or tragedy. To reiterate, it makes sense that we expect Jesus to have emotions. That we say his defining emotion is his great love for us, that we imagine him to offer the unconditional affection that we couldn’t get from our parents—perhaps this should make us a little sheepish. It could be true, but it sounds indistinguishable from wish-thinking. The Jesus of the gospels is emotionally complex. He is not as complex as the God of the Hebrews, but he gets angry at times and he weeps. His emotions, usually, have a sort of proportionality that provides a foil against Yahweh’s mood swings. 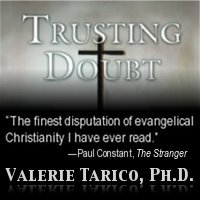 But the Jesus of modern Christians –especially liberal Christians–has a bit of that same two dimensionality that caused Joanna in Stepford to become suspicious. Perhaps it should make us suspicious too. Gallery | This entry was posted in God's Emotions: Why The Biblical God is So Very Human, Musings & Rants: Christianity and tagged affective science, anthropomorphism, psychology of belief, psychology of religion. Bookmark the permalink. Much like the other prophets Mohhamed (polygamy/superiority over women/misogyny) and Jesus (forgiveness/savior), the gods use me for temptation as well. In today’s modern society they feel people are most weak for popular culture/sensationalism, and the clues date back to WorldWarII and Unit731:TSUSHOGO, the Chinese Holocaust. They used this Situation to bury Japanese atrocities. And since the gods never committed despite tens of billions in mass media, product development and natural disasters/tragedy they will employ the freedom they positioned into the Situation and CHEAT me out of everything. Somewhere during the 1000 years the party will start to “die off”, literally. Only those who maintain chaste, pure lifestyles, resisting these temptations, will survive the 1000 years. Condemned to experience another epoch of history for their ignorant pursuit of xtianity, they will be the candidates used to (re)colonize (the next) Planet Earth, condemned to relive the misery experienced by the peasantry throughout the course of history due to their failure to ascend into heaven before the Apocalypse. The gods will offer clues throughout every dynamic of life. Geographical features on the world map is yet another. The Beast is not a person, as the xtian Bible would suggest. It is a place:::The San Francisco Bay Area. And it refers to the socio-political poison the region exuded in the latter 20th century which promoted indecent behavior among the people and caused rapid deterioration of their favor among the gods. This decay spread to other states and countries, fulfilling the region’s role as The Beast of the Apocalypse. I liked your observations and insights, sprinkled with a touch of humor and a bit of The Smiths (I listened to them in college!) Yes we are all human and need to be loved, and to give love (at least the non-sociopaths do!) I have come to experience the reality that some people really don’t have ’emotion’ and conscience, and they use religion or whatever suits them, to obtain their ends, as you have gone over in your previous posts. You are right on target about us looking to God to fulfill what our parents neglected in our emotional development.